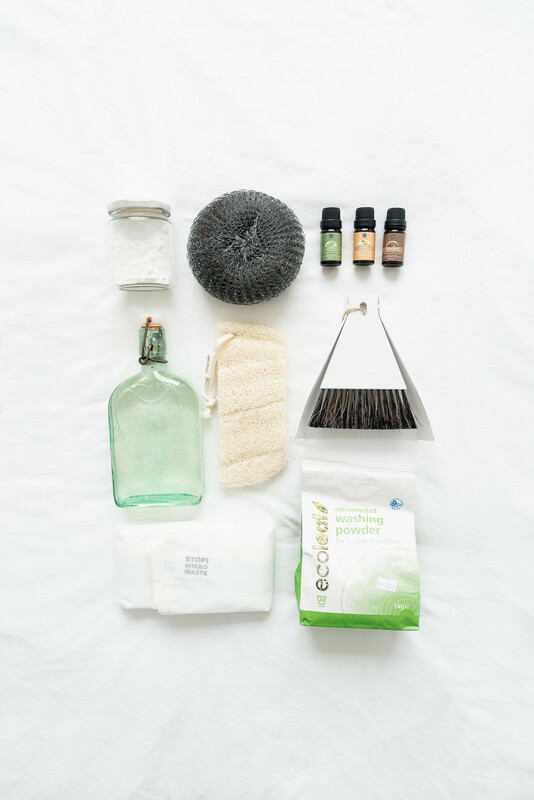 The following is a guide to eco-friendly cleaning (rather than the zero waste kind) because I wanted to cover as many options as I can from local supermarket options to make-it-yourself cleaning supplies so that you find it as easy as possible to purchase low waste, eco-friendly, cruelty-free, and affordable cleaning supplies. While buying in bulk and making your own products are the most cost effective and least wasteful ways of purchasing cleaning supplies, both come with significantly more expensive up front costs that not everyone is able to afford, and homemade recipes aren't always suitable for everyone's needs. 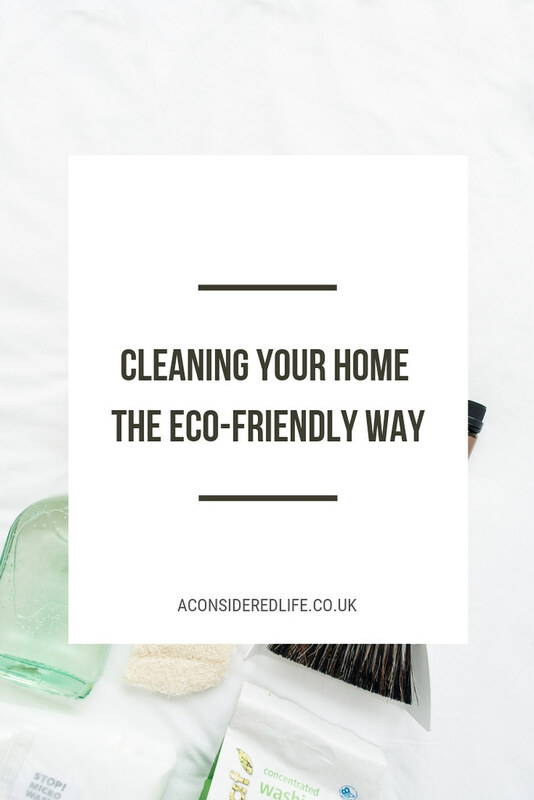 In my guide to eco-friendly cleaning you'll find suggestions for what to use when cleaning your home from scrubbers and brushes to laundry detergent and sanitisers. I've recommended products you can buy locally and online with bulk options and homemade recipes should you wish to take that route. For cleaning dishes and scrubbing pots, the a Redecker Dish Washing Brush with replaceable heads and LoofCo Washing Up Pads* do the trick. They're made from plant fibres and wood so you can throw them in your home compost once they're spent. If you need something stronger, LoofCo have a heavy duty scourer* for scrubbing away tough grime. For cleaning grout, in tight corners or tough to reach spots, old toothbrushes are useful tools to have to hand as are metal or coconut scourers. If you have any old shirts or scraps of fabric lying around, cut them up into cloths and use them for dusting shelves and cleaning surfaces. Alternatively the Ecoegg Bamboo Reusable Kitchen Towels, Ecoegg Antibacterial Wood Fibre Cloths, or Vesta Living Organic Cotton Cleaning Wipes replace the need for disposables since they can be washed in the washing machine. I use them to clean everything from the kitchen counters to the bathroom sink. Three tools can help clean your floors: a simple dustpan and brush (look for one made from metal and wood) or broom (again, look for a natural one), a vacuum cleaner, and steam cleaner. Investing in a Karcher Window Vac is useful if, like me, you have a lot of windows or your home suffers from condensation. It can be used to clean windows, mirrors, shower screens, tiles, and spills on floors effectively and quickly. There is a sustainable option for gloves, if you need them. The If You Care Household Gloves are made from FSC certified ethically sourced latex with biodegradable non-toxic inks and glues using 100% renewable resources. Both Splosh* and Method have refill options with recyclable packaging for their washing up liquids. You can buy the refills and use them in your own containers. Alternatively, purchase washing up liquid in bulk - I use this one by Bio D. I've tried Dr. Bronner's Castile Soap (a popular multi-purpose cleaner) but it didn't work for me as a dish cleaner although it might for you. If you're looking for an eco-friendly switch for your current antibacterial kitchen cleaner, try the Method Anti-Bac Kitchen Cleaner*, which is sustainably-made and a certified B corporation. It's worth mentioning the Method range is packaged in 100% recycled and recyclable plastic bottles so it's a better choice than standard cleaners. Again, Splosh offers kitchen cleaner refill pouches for your spray bottles or you could purchase the Bio D All Purpose Sanitiser in bulk. I'd argue a single multi-purpose sanitiser is suitable to use all over the house (for most people) so I buy the 5L Bio D All Purpose Sanitiser and do just that, adding a few drops of essential oil for fragrance. If, for whatever reason, you require different cleaners for different areas of your home; the Method Anti-Bac Bathroom Cleaner* might be worth trying. You could also opt for Splosh bathroom cleaner refills to reduce packaging waste. Again, buy a multi-purpose sanitiser in bulk, opt for refillable bottles from Splosh, or switch to an eco-friendly (but maybe not so low waste) option like the Method Shower Spray* if you want a separate product to clean your bath or shower. The Splosh Toilet Bowl Cleaner* comes with a nozzle designed to reach right under the toilet bowl (useful!) and you can reduce waste by refilling the bottle with their pouches. I've been refilling my bottle with the Bio D All Purpose Sanitiser and adding peppermint or citrus essential oils for fragrance. Alternatively, Ecover and Ecoleaf provide eco-friendly options. Sensitive skin can be a cause for concern when switching to an eco-friendly alternative. I had a similar fear but have discovered a few brands that are kind on the skin as well as the planet. My recommendations include Bio D Concentrated Laundry Liquid, Splosh Non-Bio Laundry Detergent*, Ecoleaf Concentrated Washing Powder*, or Splosh Laundry Powder*. The Bio D Laundry Bleach (in recyclable packaging) or Splosh Stain Remover (refillable) will help prevent marks that ruin your clothes. Try the Ecocover Fabric Softener* and see if it works for you (there's a small bottle so you can try before you invest in bulk) or make the switch to a more low waste option with the Splosh Fabric Conditioner Refill. You have bulk options too including Bio D (my favourite), Ecover, and Greenscents. For small or delicate items of clothing that tend to get tangled and damaged in the washing machine, use a mesh laundry bag. If you have any synthetic clothing, use a GuppyFriend Washing Bag* to capture micro fibres that would otherwise get washed into our waterways. Floors and windows might just as easily be cleaned using multi-purpose cleaners but if you find that doesn't do the job well enough, here are some options. The Ecozone Window & Glass Cleaner*, the Splosh Glass Cleaner Refill and Floor Cleaner, and Dr. Bronner's Castile Soap; both Ecover and Bio D provide bulk options that will clean untreated natural floors including wood, concrete, marble, and linoleum. I'm not someone who is keen to DIY my cleaning supplies. There are many simple recipes that look and sound great but I'm not entirely sold on the idea that they provide the best results or even reduce waste any more than buying in bulk does. While I agree that we only need a few products to clean our homes, I don't agree that pre-made cleaners are toxic or unsafe especially not when there's a whole range of eco-friendly cleaning products to choose from. If you want to try DIY cleaning for yourself, you'll need the following ingredients and I recommend The Organically Clean Home for recipes. Personally I haven't jumped on the zero waste DIY cleaning bandwagon. Instead, I choose to skip what I consider unnecessary products and purchase my essential cleaning supplies in bulk. I buy an all-purpose sanitiser, concentrated laundry detergent, and washing up liquid in 5L bottles (the kind my local bulk store buys) once or twice a year. It reduces packaging waste and is much more cost effective. I'm happy with the brand I use safe in the knowledge it's eco-friendly, vegan-friendly, cruelty-free, and allergy safe. Only occasionally will I use homemade cleaning solutions. 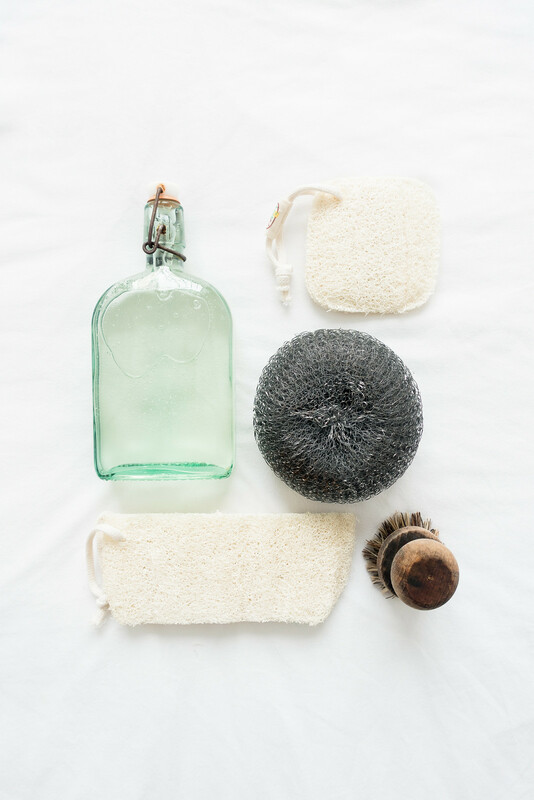 The reason why I've recommended and linked to the products I have in this post is because I've tried them, think they're great, and continue to use them in my cleaning routine. 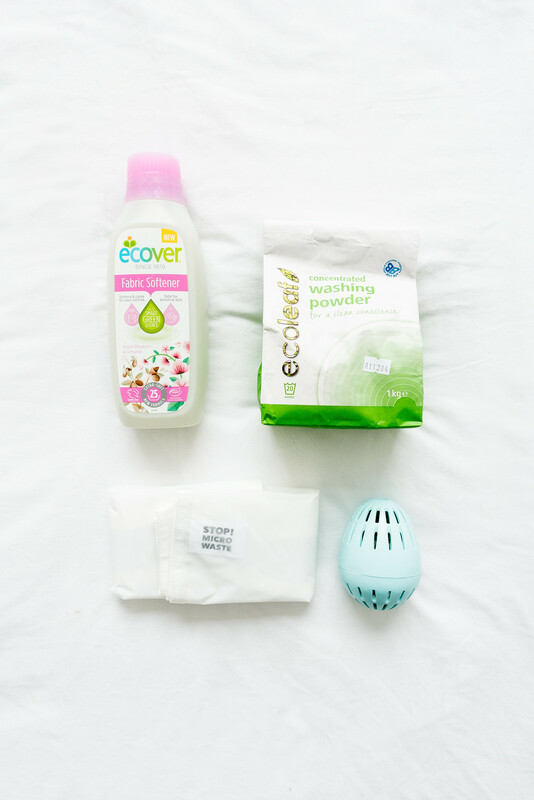 Most of the eco-brands I've linked to are available in UK supermarkets although you may be able to find cheaper options or products you prefer using. But please do look out for certifications that guarantee the product you're buying is sustainable, environmentally-friendly, and cruelty-free. Some items featured in this post were gifted (marked with an *) without any obligation to share.